Welcome to day four of our love challenge! Today we will continue with what the Bible tells us in 1 Corinthians 13:4-7 on how we should love. Remember, love is a verb, not a noun! 1 Corinthians 13:4-7 for Dummies (and that dummy is me!). Google defines boast as does not talk with excessive pride and self-satisfaction about one's achievements, possessions or abilities. The opposite of boast is humility and modesty - that's what we should be striving for as we love each other. Other translations broke it down where I could understand it better. 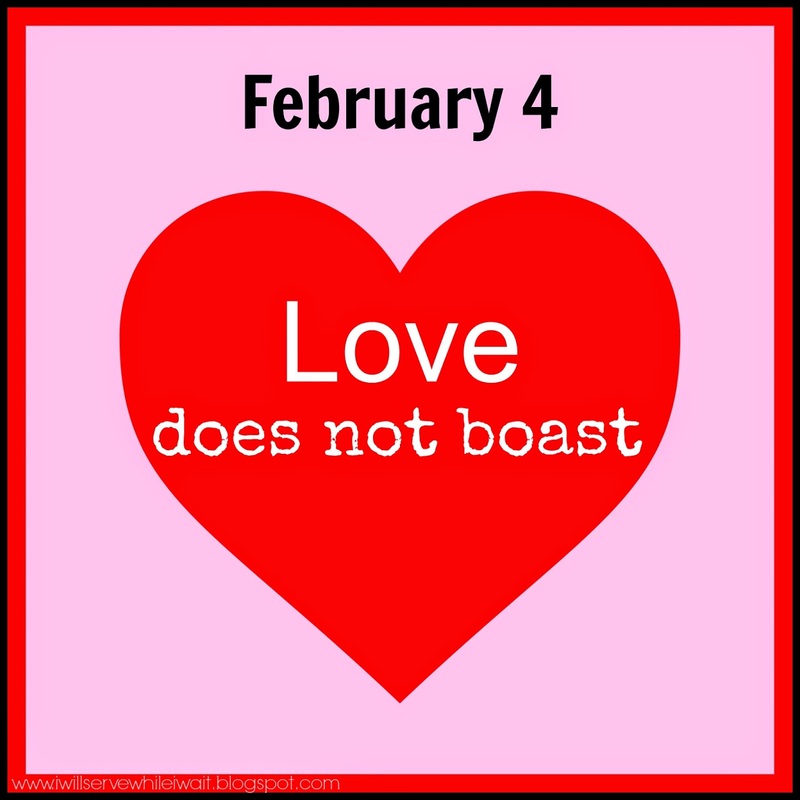 Love doesn't strut (The Message), love doesn't brag (Easy-to-Read version), and love is not conceited (Good News Translation). To the arrogant I say, ‘Boast no more,’ and to the wicked, ‘Do not lift up your horns. They pour out arrogant words; all the evildoers are full of boasting. We aren't meant to love others to build up ourselves or our own egos. We love so that we can build up and serve others. The one awesome thing you can take away from this is that if boasting is hard for you - it's ok! All it takes is a little shift in perspective - not me, but thee. If we keep our focus on God, loving people the way He wants us to will become a little easier day by day. I'm so glad you are on this journey with me! I am learning so much and I hope that you are too! Come back tomorrow for love is not proud. I love that "love is a verb, not a noun!" That's a great thing to remember! Found you on the Women With Intention link party. Isn't that such a fun little reminder? Our pastor uses it frequently and it always makes me think! Glad you found me! I hope you come back for more of the love challenge! That last verse....definitely writing that one down! And Proverbs 27:1....really spoke to me about this season we are about to enter for the next few months. It's so hard for me to separate boasting from just being proud. It's been so fun digging in to these verses. Happy to share some nuggets of knowledge that I've been gaining! God is so good! Ugh...I feel like this is a tough one with social media today! I feel like I battle this every time I post a picture...I never want others to think I am boasting/bragging about my life. Does that make sense? True about social media but if our hearts are right I think we should definitely share! I always worry about putting too much of our service project stuff out there cause I don't want others to think I'm patting ourselves on the back. I'm SO inspired by others (you especially!) that if I could inspire someone else - wow! That would be awesome! I have a feed full of outfits, vacations, cool stuff, etc. - I don't think we should feel bad about sharing our life. But, I fully agree - it's a tough one!